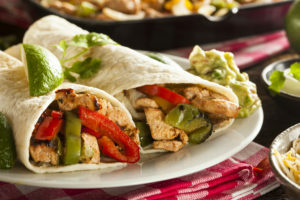 Chicken Vegetable Fajitas in Sprouted Grain Tortillas – great recipe for busy evenings! Combine the lime juice, chili powder, cumin, and garlic in a medium bowl and mix well. Add the chicken and marinate, covered, in the refrigerator for at least 3 hours. Cook the chicken and vegetables, stirring occasionally, until the chicken is cooked through and the vegetables are crisp-tender, about 20 minutes. Divide the mixture among the tortillas. Enjoy the Chicken Vegetable Fajitas in Sprouted Grain Tortillas!